Once upon a time in a distant province of China, an ordinary girl named Yehenara was born. She would one day grow up to be one of the most feared women in the Eastern world, known as the Dragon Empress. Only five feet tall, this daughter of a minor Manchu official, believed herself to be the cleverest woman alive. Historians and filmmakers have long portrayed her ‘The Dragon Empress,’ a despot and villain, murdering anyone who got in her way including her daughter-in-law and the Dowager Empress Niuhuru. For almost fifty years, this powerful and charismatic woman ruled China with iron fist inside a velvet glove, but her feudal outlook, her belief that China was the center of the universe, and that all foreigners were barbarians were contributing factors to the end of the Ch’ing dynasty after three hundred years. Yehenara’s father was nobody; just one of a thousand, nameless and faceless officials who populated Peking at that time. The eldest child, Yehenara had an unhappy childhood, feeling neglected and unloved. She once said, 'Ever since I was a young girl, I had a very hard life. I was not happy with my parents, as I was not a favorite. My sisters had everything they wanted, while I was, to a great extent, ignored altogether.' There was no money to educate the children beyond the basics. Somehow Yehenara managed to learn to read and write, making her a rarity since most Chinese women were illiterate. Her father died when she was fourteen, leaving the family in dire straits. So, at the age of 16, Yehenara and her sister were brought to the Forbidden City to join the Emperor’s harem, a step up back then for Chinese women. The Dowager Consort Kangci personally selected the girls. She was one of 60 girls who were eligible for the honor, and only 28 were picked to be Preparative Concubines. Yehenara and her sister were amongst the lucky ones. Yehenara spent two years in training, hoping that the Emperor would notice her. From the beginning, she used her time wisely, cozying up to another one of the concubines Ci’an, who had been chosen to be Empress. She also kept her eyes open, sizing up who had the real power in the Imperial palace, the Eunuchs. While she waited, Yehenara occupied herself reading her way through the palace libraries. Her luck changed when, as the story goes; the Emperor heard her singing one day and asked to meet her. Impressed with her beauty as well as her talent, Xianfeng picked her name from his nightly list of choices to grace his bed. A tablet carved from jade was turned over to reveal her name. Etiquette demanded that she be deposited, naked, at the foot of his bed. Soon she bore the Emperor a son which gained her a promotion to Consort of the fourth rank (after his 1st birthday, she was promoted again to Noble Consort Yi, placing her second in rank to the Empress). She was given the title Tzu Hsi (Cixi), meaning “kindly and virtuous.” The Emperor died in 1861. Since there was no tradition of primogeniture in China, Cixi went to the Emperor’s death bed and demanded that he recognize her son as his heir. Since Cixi’s son was only five, she took advantage of the naiveté and the good nature of the Dowager Empress Niuhuru, suggesting that they become co-reigning Empress Dowagers. However, during the three months between the Emperor’s death and his burial, a rival faction attempted to seize power. Soon Cixi, alongside 8other regents, including Empress Niuhuru, came out on top. Prince I and Prince Cheng were found guilty of treason, and allowed to commit suicide. The others weren’t so lucky, they were beheaded and their estates confiscated and divided between Cixi and Niuhuru. Cixi was now a very rich woman in her own right. Civil war raged through five provinces and twenty million people died during the early years of Cixi’s reign. Cixi initially relied on the advice of Prince Kung, who indulged her, underestimating her intelligence, believing that she would be easy to manipulate. But he soon found out how wrong he was when Cixi decided to clean up the corrupt national bureaucracy. She personally met with all officials above the level of provincial governor, who now had to report to her. Instead of favoring the Manchu elite who had held power for centuries, Cixi began to cultivate the Han Chinese, appointing officials as governors of all the southern provinces. Soon Cixi was ready to rule on her own. Her first step was to get rid of Prince Kung, who had become a little too familiar for Cixi’s liking. One day, during an audience, Cixi claimed that he had tried to attack her. He was seized by eunuchs, and stripped of all honors and duties. She later forgave him, needing his help to rule the country, but she had made her point. She had brought down the most powerful man in the kingdom and bent him to her will. Cixi now became the poster girl for the saying “Power corrupts but absolute power corrupts absolutely.” She quickly got rid of those who opposed her, not willing to share power with anyone. She raised taxes on an already overburdened populace, selling positions of influence and pocketing the money for herself. There were sumptuous banquets with a hundred courses where Cixi ate with gold chopsticks and drank out of a jade cup. Incredibly vain, she applied white make-up with a trowel, and wore sumptuous gowns decorated with precious gems. At the end of her life, her personal jewelry vault contained 3,000 ebony boxes of jewels. She used naval funds to rebuild the summer palace that had been destroyed during the 2nd Opium War. As she grew older, she became a tyrant, punishing her household with beatings for even minor infractions. She apparently enjoyed having two of her maids repeatedly slap each other. When she turned 60, every courtier was obliged to donate 25% of their salary to her and to buy lavish gifts to celebrate the birthday girl. By the end of her reign, she has amassed a personal fortune of 8.5 million pounds. Unfortunately Cixi’s son, Tongzhi, had inherited none of her intelligence and ambition. He was spoiled and indulged by everyone, but he led a lonely life, with no playmates of his own age. By his teens, he was alcoholic, preferring to hang out in brothels. At the age of 16, a wife was chosen for him from amongst the daughters of the Manchu officials. Cixi took an instant dislike to Alute, fearing her influence over her son. Despite being officially crowned Emperor, Tongzhi preferred to leave matters in his mother’s capable hands, while he drank and shagged anything that had a pulse. Two years after he was crowned, Tongzhi was dead from a combination of venereal disease and smallpox. He was only 19. 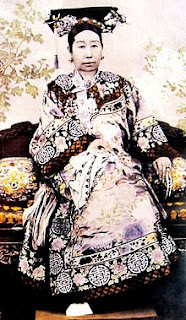 His wife, Alute, soon committed suicide by swallowing opium but gossip had it that Cixi had her murdered. Not leaving anything to chance, Cixi called a meeting of the Grand Council to discuss the succession. The lucky winner was her nephew Guangxu who was only three. Her choice violated the laws of ancestor-worship but Cixi didn’t care. Despite opposition from more conservative members of the council, Cixi got her way. On February 25th, 1875 Guangxu was proclaimed Emperor. Cixi’s second regency was a disaster for China. Immediately, Cixi locked horns with the French, Japanese and English, all of whom wanting to trade more in the East; had struck deals with China’s neighbors. When Cixi wanted to declare war on Vietnam, who had been forced into a treaty with the French, and her council didn’t back her up, she had them sacked. She replaced them with a group of “yes” men, and proceeded to go to war. China lost, and France ruled Vietnam for the foreseeable future. Meanwhile Japan seized the chance to go after Korea. In order to pay for the costly wars, taxes were raised. Ironically what made Cixi so popular was her stance against foreigners, but it also brought China to her knees. Finally when the Emperor turned 19, Cixi agreed to retire but it was in name only. She spent her time spreading rumors that the Emperor was childlike and incompetent. Guangxu was the exact opposite of his rigid, conservative aunt. He believed that China needed to learn from the West in order to survive. He initiated what came to be known as “Hundred Days of Reform,” issuing decrees ordering railroads to be built, modernizing the military, reforming the legal system, dismissing thousands of Manchu officials who opposed his reforms. Cixi was livid. When she got word that the Emperor’s advisors suggested that she be placed under house arrest, she stormed the Forbidden City, with members of the army that had remained loyal. She forced the Emperor to rescind his reforms, imprisoning him in a palace in the middle of an island. He was totally isolated from the court, his servants either put to death or banished. His only companions were four guards and his wife. Cixi was back in charge. However, her policies were ruinous to China. She made the mistake of aligning herself with the Boxers, encouraging their efforts to rid China of all foreigners, missionaries, and Christian converts. No one was safe, buildings were burnt. The foreign governments weren’t about to take the murder of their citizens lying down. Over 20,000 foreign troops (including American) marched towards Peking. Cixi, along with the rest of the Imperial family, fled the palace dressed ironically as peasants. When the Emperor’s favorite concubine begged Cixi not to abandon Peking, she was allegedly thrown down a well. For the first time, Cixi came face to face with the reality of the lives of the ordinary citizens of China, the grinding poverty and the famine. The Empress, who was nothing if not practical, decided to stop the war (against the advice of her advisors) with the Allied Powers, once she was assured of her continued reign after the war. China agreed to pay almost $333 million in war reparations. Finally, Cixi saw the light and was willing to build the railroads, and schools that Guangxu has been pushing for. Ironically, she began implementing a reform program that was more radical than one that had been proposed before. She began inviting the wives of foreign diplomats for tea. 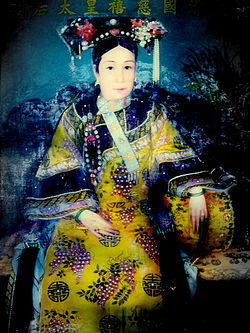 To rehabilitate her image, Cixi allowed a young photographer to take elaborately staged shots of her and her court. In 1907, Cixi suffered a stroke. While she recovered, the Emperor fell ill and died of what is now known to be acute arsenic poisoning. Historians now speculate that Cixi knowing she was dying wanted to make sure that the Emperor would not continue his reforms after her death. Cixi died a day later, but not before installing her grandnephew Pu Yi as the new and last Emperor of China. Her tomb, which she had ordered destroyed and reconstructed in 1895, was destroyed again 1928 by the Kuomintang general Sun Dianying and his army. They stipped the tomb of its jewels, and dumped Cixi's corpse in the mud. The tomb was restored in 1949 by the People's Republic of China. Recent biographers have taken a different view of Cixi than the more traditional view of a devious despot. They claim that Cixi was just a convenient scapegoat for problems that were beyond her control, a leader no more ruthless than other male rulers, and an effective but reluctant reformer in her last years. Many of the more sensational stories written about her by people who never met the Empress and concocted stories to feed to the Western Press who had their own reasons for wanting to blacken her name. 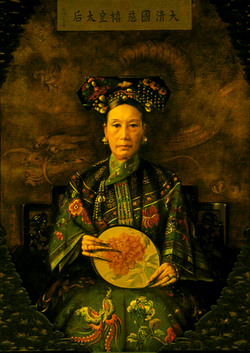 Katherine Carl, who painted Cixi in her later years, wrote a sympathetic memoir describing the Empress as kind and considerate. In her later years, Cixi apparently had many regrets about the past and how she had dealt with the many crises of her reign. Exhibition: The Empress Dowager, Arthur M. Sackler Gallery, Smithsonian Institution.